Empress traces the rise of Heavenlight, a seventh-century Chinese woman who becomes its first and only female emperor, Empress Wu Zetian. Shan Sa takes us through Heavenlight’s life, from (bizarrely enough) the womb to her death. Her parents are born noble but rule a humble household (well humble in comparison to the monstrosity of the emperor’s palace), her mother cold and distant. Her father dies when she is young and her family is ill-treated by his clan (she is his second wife). Heavenlight is an unusual girl for her time – a tomboy. For her ninth birthday, she receives armour from her father, and another sends a falcon. And she attracts the attention of a general who sends her to the Emperor Eternal Ancestors’ court, and given the rank of Talented One of the fifth rank, now officially overtaking the rest of her clan. It is her less than ‘feminine’ ways, especially her skill with horses, that makes her stand out and allows her to make friends with Little Phoenix, who is the King of Jin and one of the grandsons of the Emperor (I think – the hierarchy is confusing). Heavenlight and Little Phoenix (who is three years younger) grow up together and eventually become lovers. And though not not a direct heir, through some chance of fate, Little Phoenix becomes the Emperor of China. Heavenlight’s intellect and wiles helps him maneuver his way through all the politicking and seal his power. And she eventually wrangles her way to become Empress. She is ruthless and doesn’t hesitate in delivering punishments (sometimes death) where she thinks it necessary. Heavenlight’s story is a fascinating one. Despite being surrounded by plenty of supporting characters, she is lonely and struggles to keep her place (and that of the emperor) as all that wrangling for succession plays out. 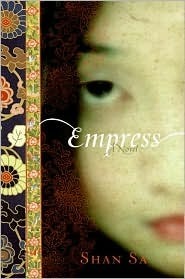 Empress is a colourful historical novel. It shines with its descriptions of palace life, of life in the Tang Dynasty. “The Side Court was a kingdom within the Empire, a painted box inside a golden trunk; it was a labyrinth of tiny rooms separated by walls of adobe clay, bamboo hedges, and narrow passageways. Official pavilions, little gardens, tunnels of wisteria, and countless bedrooms were linked by long covered galleries. Thousands of women came and went with a rustling of sleeves and a murmuring of fans, without ever exposing themselves to the sun or the rain. Imperial hierarchy was scrupulously respected despite the confines of that overpopulated world. The further down someone was on the social scale, the smaller her room, the simpler the decor, and the more modest the furniture. The slave quarter was packed with ramshackle little houses, gloomy rooms, and cold beds; the women there were like insignificant stitches in a vast embroidery. But this story does get bogged down by a little too many details of courtly life like formal ceremonies, politicking and its many side characters. A bit of a slow-paced read of the life of an unforgettable historical figure. This is my eighth read for the Global Women of Colour Challenge (challenge page). Shan Sa is the pseudonym of Yan Ni, who was born in Beijing, China, and began writing and publishing poems from the age of 7 and also began studying Chinese calligraphy and traditional Chinese painting. Her first collection of poems was published at her age of 10. She became the youngest member of the Beijing Writers’ Association at age 14. In 1990, as a teenager, Shan Sa left Beijing for further studies in Paris, France. She learned French and studied philosophy in a Paris university while attending courses in art history at the École du Louvre. The Girl Who Played Go was the first of her novels to be published outside of France, and won the Prix Goncourt des Lycéens (a prize voted by secondary school students). Les Poèmes de Yan Ni (Yan Ni’s Poems) (1983). Porte de la paix céleste (Gate of Celestial Peace) (1997). Les quatre vies du saule (The Four Lives of the Willow) (1999). La Joueuse de Go (The Girl Who Played Go) (2001).